After offering just a tease of its LTE-based Windows Phone this morning, Nokia is set to share a lot more details on Monday afternoon. The same folks who were on stage at AT&T’s event this morning — Nokia CEO Stephen Elop, Microsoft CEO Steve Ballmer and AT&T Mobility chief Ralph de la Vega — are all expected here, and one would presume they will have devices in hand. 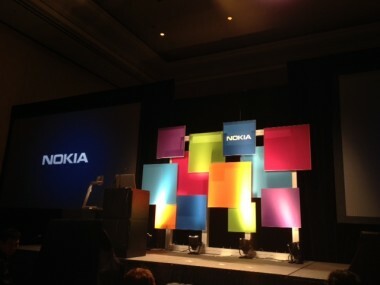 As a reminder, Nokia has already announced its first Windows Phone for the U.S. — the Lumia 710 for T-Mobile. 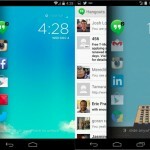 That phone, due this month, is an entry-level product that will sell for $50 with a new contract. We’ll have live coverage, wireless permitting, once the event starts around 3 pm PT. 2:53 pm: OK, we’re here, charged up and logged in. Fingers crossed that Wi-Fi behaves for the event, which should run for about an hour. 3:02 pm: Elop takes the stage. “It’s wonderful to be here in North America on behalf of Nokia,” says Elop, the Canadian former Microsoft executive. 3:04 pm: Elop very briefly mentions the company’s entry-level phones for emerging markets, before turning to the company’s Windows Phone-based smartphone strategy. Elop uses his favorite lines, talking about how a battle of devices is now a war of ecosystems and once again refers to the Lumia 710 and Lumia 800 as the first real Windows Phones. 3:06 pm: Elop talking up Lumia 710, which goes on sale this week (Jan. 11) on T-Mobile. Nokia Lumia 900 for AT&T introduced with a video. Elop holding it up, talking about AT&T’s exclusive. Initially available in black and cyan (that’s blue to you and me). Primary camera has Zeiss optics and wide aperture for low light along with a front-facing camera for video chat. 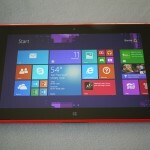 It looks like the Lumia 800, only bigger with its 4.3-inch screen. 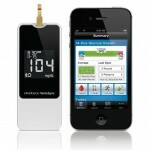 3:10 pm: Nokia senior VP Kevin Shields comes up to show off a few of the device’s features. 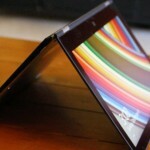 The device is made from injection-molded polycarbonate, like the N9 and Lumia 800, which it looks an awful lot like. 3:17 pm: Shields touts the phone’s front and rear cameras, Nokia Drive (built-in turn-by-turn directions) and some custom apps such as the ESPN Windows Phone app that is exclusive to Nokia. Other partners include Univision, the Atlantic Coast Conference and Sesame Street (of which I am a huge fan). 3:21 pm: Ballmer now on stage talking about Microsoft’s partnership with Nokia. He notes that Nokia has delivered the first Windows Phones in well under a year. 3:23 pm: Ballmer underscored, as he has repeatedly of late, that Microsoft has “room to grow” in terms of selling Windows Phones. 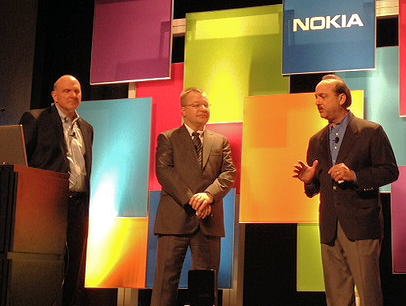 3:24 pm: Now out is the third in the executive triumvirate, AT&T Mobility chief Ralph de la Vega. “We’ve been spending a lot of time together,” de la Vega said, noting their appearance together at AT&T’s event this morning. “We’re big fans of Windows Phone,” he said. Time for Q and A. 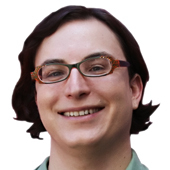 3:28 pm: What about Verizon? “Today we are just announcing AT&T” but clearly the company wants to get in front of as many U.S. consumers as possible. That said, he added that “we do need some elements of differentiation.” The company is focused on specific apps and other things that won’t break compatibility within Windows Phone. 3:33 pm: As for where Nokia is headed, Elop indicated the company sees room for Windows Phone devices that cost less than the 710. 3:38 pm: Asked about what it would take for Nokia to get into tablets, Elop said it would want room to stand out. 3:40 pm: Why no NFC? 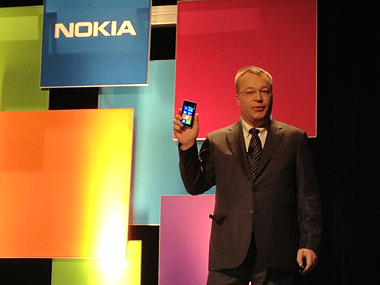 Elop notes that Nokia has been a pioneer in near field communications and already ships it on some Symbian phones. As for why it is not on the first Windows Phones, Elop said the company had to prioritize and it wasn’t the most critical thing for consumers at this point. Asked for an update on reports that Nokia looked at some sort of deal for RIM, he said, “There’s never been any information at all so there is no update available.” That said, he indicated Nokia does see an opportunity to make inroads in the business market RIM has dominated.